Soap molecules have polar end groups and long hydrophobic tails. In the presence of water, they arrange themselves into spheres called micelles. These structures can transport greasy particles in their interiors, helping remove the bits that water can’t remove on its own from your hands or clothes. 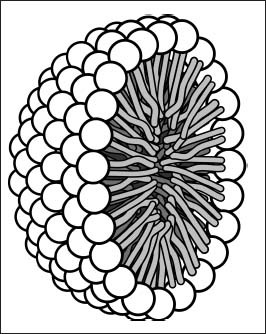 Soap molecules arrange themselves into micelles like this one (shown as a cross-section), which can move grease into the center of the structure.